Our house here in India turned spontaneously into a film location for the production of an advertising spot. And what a refreshing experience it was! It also felt as if my past role as design director was catching up with me. This time, not in a creative role though, but as host, which was rather delightful. This entry was posted in Awakened Hearts (all), Society, Traditions East & West, Travelling on 14/04/2019 by Marina. This is a beautiful example of a small temple in our neighbourhood in the Himalayan foothills, that is fully integrated in people’s life (Garhwal region of Uttarakhand, in India). Here some snapshots and videos of local women celebrating – a daylong joyful get together, including praying / chanting / dancing/ food- and flower offerings to Devi. Honouring the inner and outer goddess. This entry was posted in Awakened Hearts (all), Society, Traditions East & West, Women on 14/01/2019 by Marina. This information streamed through me upon asking Highest Supreme Consciousness about the power of the trident, also called Trishul. Promemoria: The trident is said to be the weapon of Poseidon (or Neptune) the god of the sea in classical mythology. In Hindu mythology it is the sacred weapon of Shiva (but also Durga), known as trishula (Sanskrit for triple-spear). In Greek, Roman and Hindu mythology, the trident is said to have the power of control over the ocean. This entry was posted in Awakened Hearts (all), Higher Consciousness, Traditions East & West on 19/03/2016 by Marina. Today, 22 Dec. 2015, we have the Northern Hemisphere Winter Solstice. From now on the days are getting longer again. What more and more people begin to acknowledge is, that this is the original reason for festivities in December. Yes, Christmas is the time when we celebrate the birth of Jesus or the rise of Christ consciousness, but there is more to it. This entry was posted in Awakened Hearts (all), Traditions East & West on 22/12/2015 by Marina. The 33. 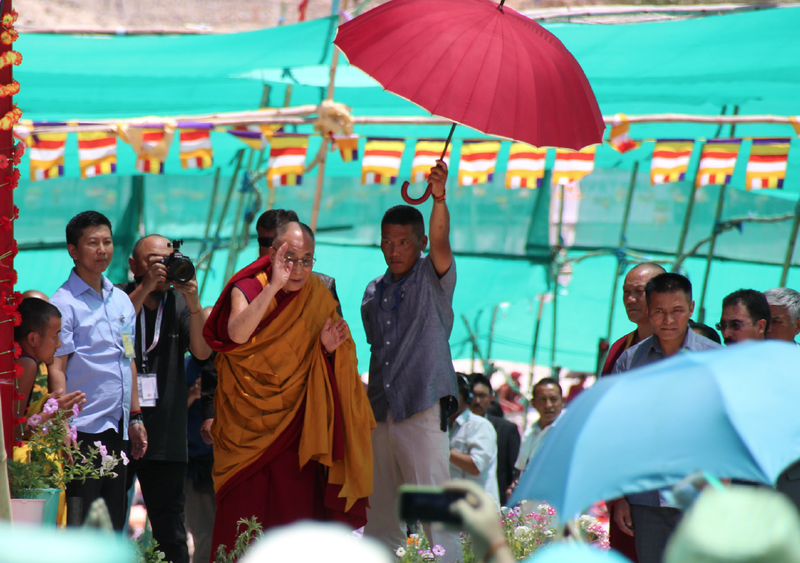 Kalachakra Empowerment in Ladakh, North India with His Holiness the 14. Dalai Lama. Some of you knew, some of you might have guessed it: I went to the Kalachakra Initiation in Leh. Short notice my husband booked our flights (Delhi – Leh) and off we went. What can I say? It was awesome. And No, I did not convert to Buddhism. I simply followed my heart’s impulse and soul’s thirst to experience this empowerment. As far as I’m concerned, the religious denomination is just the packaging. I’m interested in what’s inside the wrapping, the actual forces at work, which are universal and cosmic. This entry was posted in Awakened Hearts (all), Traditions East & West, Travelling on 20/07/2014 by Marina.